McLaren’s new Ultimate Series flagship, the Speedtail, will embark on an year-long test run in prototype form, where it will first spend some time at bespoke automotive test facilities, followed by real-world traffic action in Europe, North America and Africa. This first attribute prototype has been dubbed ‘Albert’, as a direct tribute not only to the legendary McLaren F1 mule which went by the same designation, but also to the Albert Drive premises, where the F1 was designed. Boasting a unique testing livery, ‘Albert’ is equipped with a production-spec chassis and petrol-electric hybrid drivetrain, as well as a unique three-seat cockpit configuration, with a central driving position. The hypercar’s 1,050 PS and 403 km/h (250 mph) attributes will be trialed by the automaker’s chief test driver and former IndyCar champion Kenny Bräck. “The start of real-world testing represents a major step in the development of the McLaren Speedtail. 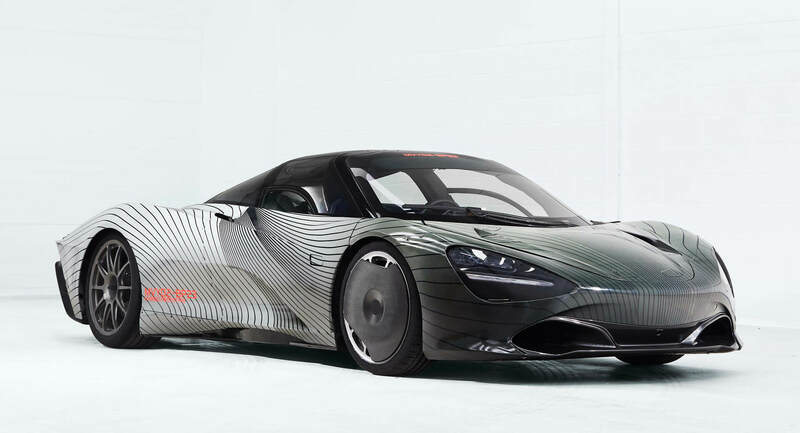 As the first fully representative prototype, ‘Albert’ will build on the invaluable work still being put in by earlier development cars, allowing us to sign-off vehicle attributes including chassis dynamics, brake performance, damper tuning, tires, NVH and aspects of ergonomics and comfort,” stated McLaren’s head of vehicle development, Ben Gulliver. Despite its bespoke test livery and bodywork, this prototype is still fundamentally a Speedtail, with shape-representative body panels, dihedral doors and a unique carbon fiber monocage core structure. With a price of £1.75 million (plus local taxes), the McLaren Speedtail will go into production at the end of 2019. As for first deliveries, they will take place in early 2020, with all 106 cars having already been allocated to their future owners.